Hey there! My name is Chris Fong and I was born and raised near San Francisco where I still live today. I actually love my full-time job as a software engineer. But I have also been doing affiliate marketing as a side hustle since 2009. It all started when I bought a cheap $7 ebook on the DigitalPoint forums that helped me earn my first $1 online. I dabbled in a bunch of strategies, but my main success has always been in building websites. Back in the day, it used to super easy to rank niche sites in Google using various grey and blackhat tactics. I was able to hit six-figures in affiliate commissions really easily, and life was great. But then in 2011, things came crashing down with the infamous Google Panda update which took out most of my affiliate income overnight. This made me realize that doing blackhat stuff wasn’t a sustainable strategy. So I focused my energy on creating an authority site and that’s how SmartBusinessTrends.com was born. I started reviewing and writing about my favorite marketing tools and after a time, I was able to rank for various product related keywords very easily. This led to real success promoting tools like ActiveCampaign, ClickFunnels, LeadPages, ConvertKit and many other affiliate programs. I would like to say because I’m smart. However, I’m just always reading, testing, and creating new assets that will help me grow my own affiliate business. I’ve also FAILED a lot too! While I used to keep everything I learned to myself, I recently started sharing what I’ve learned to my FB group and others on my email list. This helped me discover that I get a lot of satisfaction from helping others grow their own business as well. And I want to help you too. Since it’s easy to say anything on the internet, here’s a few screenshots of my recent earnings to show a little transparency. How Do I Get Started With Affiliate Marketing? This is the most common question I get. And it’s not easy to answer since there are so many ways you could get started. But I’ve adapted this simple system from Spencer Mecham (the #1 ClickFunnels affiliate) that I think anybody can implement. First you should decide what traffic source you would like to focus on. This will be based on your specific strengths and skills. If you’re good at writing, then I would suggest blogging. If you’re comfortable making videos, I would go with Youtube. If you have some money and want quicker results, then you can try paid traffic like Adwords, Bing, Facebook Ads or Solo Ads. Then you need to decide on your hook. Create a squeeze page that offers your lead magnet in exchange for an email address. When someone opts-in, promote a related offer on the thank you page. ClickFunnels or LeadPages is perfect for this. Finally, the last step is to write your email sequence. You will want to write at least 10 emails, spaced over 30 days. But if you can write more, then write more. In these emails, get personal, share your story, be entertaining and promote GOOD affiliate offers that will benefit your leads. Now you have a working passive income affiliate funnel! You're ready to send as many visitors to it as you can using your chosen traffic source. You’ll build your email list and your email sequence will make you affiliate commissions on auto pilot. As you get more successful, keep adding more and more offers into your sequence. What’s a good lead magnet to use? I’ve found that reports, checklists, videos and software work really well as lead magnets. If you use ClickFunnels, share funnels can also be very effective. Here are a few lead magnets that have worked really well for me. You can use these as inspiration for your own. What affiliate products should I promote in my email sequence? I always suggest promoting affiliate products that you have used yourself. 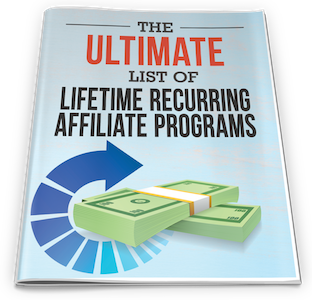 I’ve put together a great list of Lifetime Recurring Affiliate Programs that you can pick from as well. I’m too lazy to do all this. Do you have a done for you solution I can try? Sure, try my Viral Affiliate Marketing Funnel (ClickFunnels) or the Million Dollar Passive Income funnel (BuilderAll). I’ve had success with each. Where’d you get those eBook covers designed? I used Tim from the Funnel Rolodex. I highly recommend him. I’m broke and I need money fast. Will this work for me? Probably not. From my experience, there’s no totally free method that works that fast. If you want to succeed with affiliate marketing, you going to have to invest some amount of money. If you’re broke I would suggest trying to offer some services on some freelancing sites to earn some money. Do you offer 1-1 coaching? I offer free email/FB messenger support for all of my ClickFunnels affiliates. If you’re interested in this, check out my ClickFunnels bonus page. What other bonuses do you offer? I currently have bonuses for these products. But if you want to buy some other product that I review on the site through my link, hit me up over email or chat and we can work something out. Do you offer any free stuff? Yup, check these free reports/guides I've made. Yeah, I’m selling my Ad Extractor chrome extension. It lets you save the ads from any Facebook page with one click. Which is perfect for anyone trying to get better at creating Facebook Ads. 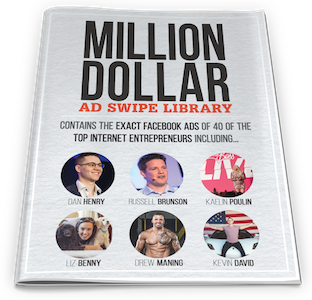 Or use it to create your own lead magnets like my Million Dollar Swipe Library. But I’m in your group. Can you give it to me for free? Maybe…if you give me video testimonial for it. Which FB groups are you active on? What’s are the best courses for learning Affiliate Marketing? Affiliate Outrage by Stephen Larsen is a free drip email course I highly recommend. Affiliate Secrets 2.0 by Spencer Mecham is the best paid course I’ve opened my wallet for. If you don't know him yet, Spencer is the top ClickFunnels affiliate with over $1 million in affiliate commissions. It's not cheap, but hey... you're learning from the best. Where can I learn SEO? If you’re in my 1-1 coaching then I’ll help you out as well. Where can I learn solo ads? I’ve learned all that I know about solo ads from Catlin Bettridge. I would grab the VIP all access pass from the Affiliate Ninja Summit and watch his training. Where can I learn Google Adwords? Not from me. My account is banned. But the best Adwords training I’ve taken is from Spencer’s Affiliate Secrets 2.0. How can I learn to write better copy? I like the Kopywriting Kourse blog by Neville Medhora. He used to write all the copy for Appsumo. How do I get better at email marketing? Visit bensettle.com and join Ben's email list. He’s the best. What’s the best ClickFunnels training? Oh, and read both DotComSecrets and Expert Secrets. How did you become a successful ClickFunnels affiliate? Although I’ve been promoting CF for a long time, I wasn’t too successful until recently. That’s when I put together an irresistible CF bonus offer, started participating more in the CF related FB groups and helping people out. That finally got my little blue car moving in the right direction. What email service do you use? I currently have paid accounts with ActiveCampaign, ConvertKit, Aweber, and Drip. But I recommend ActiveCampaign in most cases. Unless you’re doing solo ads in which case I recommend Aweber so you can do affiliate promotions. What web hosting do you use? I use WPX Hosting for this site. It’s awesome. Can I chat with you on FB? Sure, I’m pretty friendly. Hit me up. BuilderAll Review: Should You Replace Your Marketing Stack With It? MailChimp Review: Why Is Everyone Switching Away? Take a look at the bonuses we are offering for some of our favorite products and services. Learn how I made $14,553.16 last month promoting my favorite marketing tool. Download this 8 page guide to see how I did it, and how YOU can apply the same principles to promote your own favorite products. Check your inbox right now to get the free report you just requested. It's an awesome community of new and expert affiliate marketers and I share some of my best tips and resources on affiliate marketing inside. Best of all, it's completely free to join.